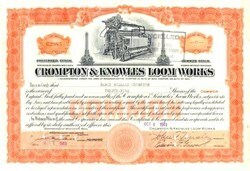 Beautifully engraved certificate from the Crompton & Knowles Loom Works issued in 1937. This historic document was printed by the American Banknote Company and has an ornate border around it with a vignette of an old loom machine. This item is hand signed by the company’s president, treasurer, and assistant trust officer and is over 69 years old. Of the dozens of Worcester firms making machines for the textile industry, Crompton & Knowles Loom Works was the largest and most successful. George Crompton and Lucius Knowles each launched successful loom making companies. Both patented improvements to power looms that enabled weavers to make intricately patterned and delicately colored designs. Their rival firms merged in 1897. After buying out specialized manufacturers, the company boasted that they made "a loom for every fabric." Through the mid-twentieth century, Crompton & Knowles completely dominated the market for fancy looms in America, and for woolen looms in the world.